The Sea Mobile on its way to an event. 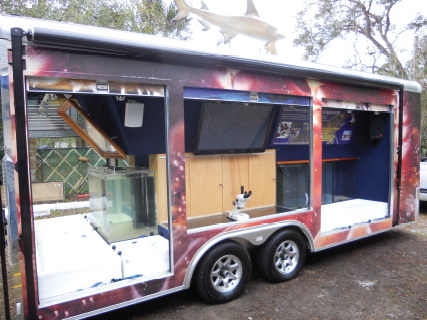 Side view of the Sea Mobile showing white touch tanks, clear acrylic tanks, one of the light microscope and one of the 42 inch flat screen televisions. 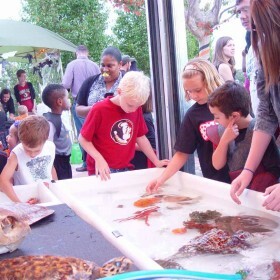 The Gulf Specimen Marine Lab Sea Mobile marine life educational traveling exhibit is a mobile aquarium self sustained complete with state of the art filtration system and able to house a wide variety of live marine life so that we can bring the aquarium to your school, festival, birthday party, or other special event. It holds 450 gallons of saltwater aquariums including 5 touch tanks with starfish, sea urchins, conchs, crabs, sponges and a variety of other interesting and colorful sea life from the Gulf of Mexico that are safe for children to pick up and handle. Also, 7 acrylic aquariums filled with octopus, stone crab, file fish, gorgonians, shrimp, and a variety of fish and invertebrates from the Gulf of Mexico. The Sea Mobile also has 2 Light microscopes with video camera adapters hooked to 2 LCD 46 inch flat screen televisions that allow visitors to see the intricate details of a sponge or tiny creatures such as amphipods swimming across the screen. There are also 2 Blue ray players hooked to the televisions so we can also play informational videos. 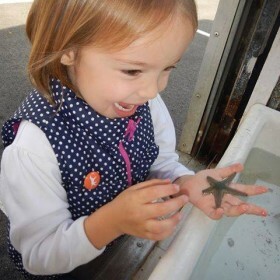 Gulf Specimen Marine Lab has worked with school teachers to design lesson plans that meet federal and state standards, are formatted to specific grade levels, and teach children of varying ages about sea life, marine biology, and the conservation of our marine resources. Lesson plan topics include: sea turtles and their food webs, marine invertebrates major phylas, and more. Bring the Sea Mobile To You! If you decide to book the Sea Mobile please call to reserve your date right away. I am a Fifth Grade science teacher at Seminole County Elementary School. 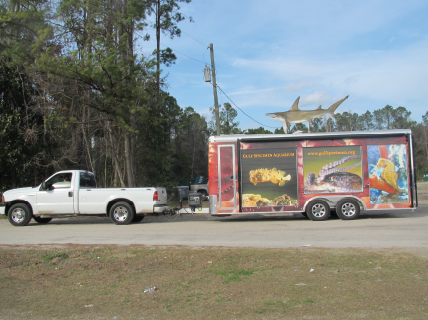 Our school was visited by the Sea Mobile from Panacea, Florida. This was arranged by our school’s PTO which is very active in bringing innovative learning experience to our students. This week we were given a very interesting and engaging introduction containing information on sea turtles and human impact on these creatures, both beneficial and non-beneficial. Mr. Tom was quite engaging and held the students’ attention with his slides and presentation. He handled the 4th and 5th graders with ease and grace. The students were so enthralled with the live sea animals and even the most frightened students mustered enough courage to touch the creatures. Many of our students are not granted this kind of close encounter with sea creatures. 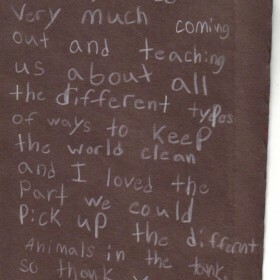 I also enjoyed my encounter with the animals and hope I did not harm them. They certainly enriched the lives of the students as you can tell by the enclosed letters written by one of my small classes. This experience addressed three of the main learning conduits auditory, visual and kinesthetic. It is a very balanced approach to learning. It is like the one that I seek to provide my students often. The students are still bringing up the information in class. This is a good indicator of the merits of the program. In this day of budget cuts, it is easy to cut the “extra stuff.” However in my book, this is not “extra stuff” It is a vital and essential in raising students awareness of the global and natural crises they will face in their lifetime. It is critical to impart to our children ways they can help out now to avoid problems in the future. Our students want to be proactive, not reactive. They are realizing that the world they will inherit will need help. Thank you for sustaining this program for our children and our future. 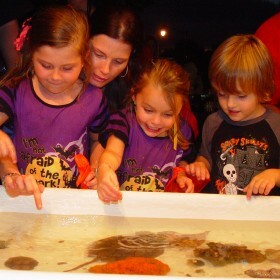 Children enjoying gently handling safe marine life in the Sea Mobile’s touch tanks.